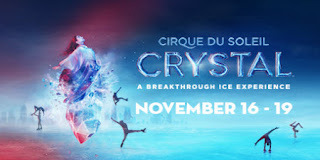 We got a chance to see Crystal, Cirque du Soleil's latest arena show, which is here in Chicago (actually Hoffman Estates) on a short run through November 19. 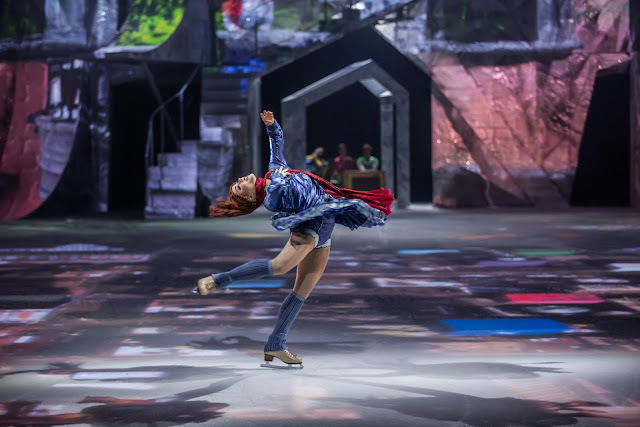 I saw the opening night on November 16, and wanted to rush this review out because it's a really fun show, and well worth seeing, especially if you like ice shows. The show starts with a very fun pre-show. The stage is set, and hockey players are messing around on the ice, the clown is encouraging people to throw snowballs at him, there's a couple flirting on the ice. It's a small town in Canada or New England where the local skating pond is the center of attention. 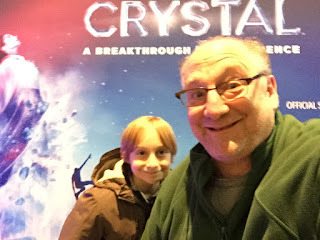 Then the show starts, the lights dim, and the structure in the back of the ice rink lights up, and displays a computerized slide show that shows off our protagonist Crystal. Her parents are yelling at her, her friends are making fun of her, and she needs to get away and go for a nice long skate. 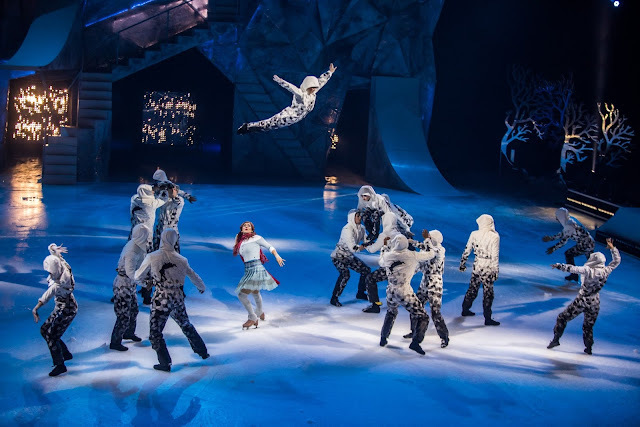 She is out on the ice when the unthinkable happens. In a startling visual effect, the ice cracks, and like an ice skating Alice in Wonderland she descends into the world beneath the ice. 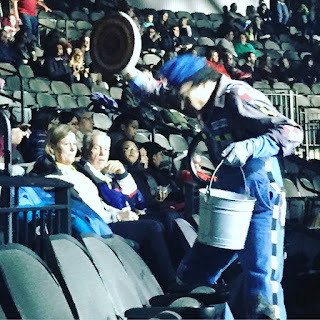 The clown in the audience during pre-show. It's a great concept, and if they could have kept that story going, and showed us what the underwater world was really like, and kept it up, it would have been outstanding. 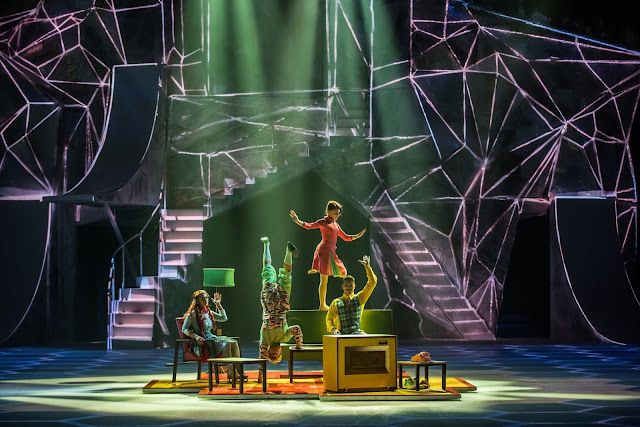 But like most Cirque shows, the plot gets a little murky and unclear as the circus acts take over, and the story goes out the window. As always the set is wonderful, and the circus acts are great. Circus acts take on a new meaning of bravura when they take place over frozen water, and every acrobat and performer is a superb skater and it shows. A special shout-out to the swinging poles act, which is a pole act that sort of becomes a flying trapeze act in the middle, as the poles swing to each other and the acrobats vault to the pole. I was also really taken with the hockey routine, in which 4 or 5 ice skating acrobats do skateboard-like tricks on skates, getting 10-15 feet of air on ramps as they jump up and do all sorts of impossible flips and stunts on ice. 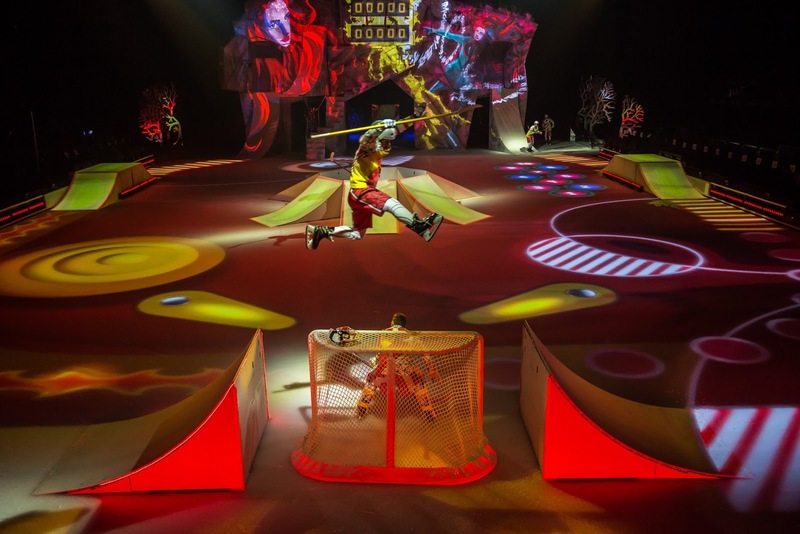 There's also a really nice juggling act, a breakaway ice bike, lots of hand-balancing and aerial work, and a live band that plays an eclectic range of music. 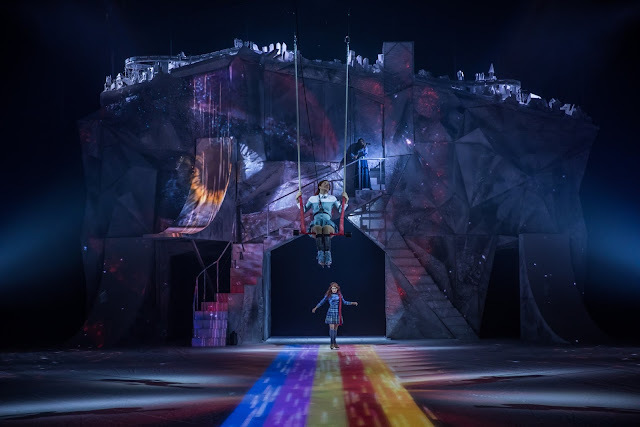 The following photos were provided by Cirque du Soleil and were taken by photographer Mathew Beard. 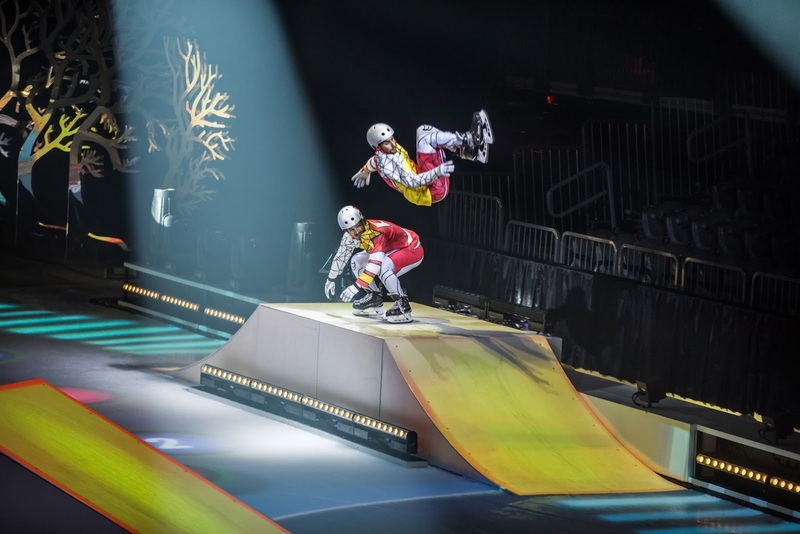 The show is performing in the Sears Arena in Hoffman Estates. It's a little bit of a hike from Chicago, and lots of the shows are right after rush hour, so you should leave early. It took us a little over an hour to get there (and I live in the north of Chicago, and it's supposedly 29 miles from my house) There's a shopping mall nearby with plenty of eating choices. SPECIAL SNEAK PREVIEW OF THE SHOW! After the Chicago dates, the show will tour Canada and the US for at least the next 6 months. Here's a list of cities and dates where Crystal is coming.